Widely used in landscaping Acacia floribunda is a fast growing small tree with a natural weeping or pendulous habit. It works well as a background tree in the garden border and is useful in new landscaping projects as it establishes a good size quickly. Also suited for use an informal screen or windbreak. 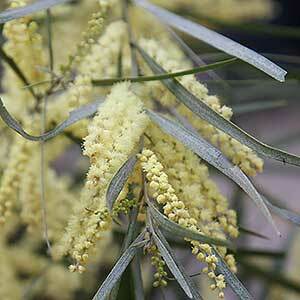 The flowers are a paler yellow than many other Acacia, cylindrical in shape, around 4 – 5 cms in length and attractive. The low growing Acacia floribunda ‘Compact dwarf’ form which will reach less tham 1 metre in height in most conditions. Acacia floribunda x genistifolia, which is a hybrid. Once established this is a very low care species. Plant in full sun to light shade after digging over the soil well. Soil needs to be well drained through the year. In poor soils a little compost added can be beneficial. An annual application of a native plant fertiliser will assist with growth rate. This is a species that can be pruned to maintain size and shape. From seed which will need scarification to germinate. Common Name – Sallow Wattle, Gossamer Wattle, White Sally, Sally Wattle.